Up next in the Superfood Salad series is this tasty chicken salad, made extra juicy and nutritious with the addition of blueberries, roasted red peppers, and crunchy walnuts. Place red peppers inside down on a lined baking tray and roast for 15-20 minutes, until tender and slightly charred. Set aside to cool off. While the peppers are roasting, rub the chicken breast with a little olive oil, and season with salt and pepper. Pan fry the chicken over medium heat for 8-12 minutes, until the juices run clear. Set aside and let the meat rest. Prepare the vinaigrette by combining the oil, vinegar and mustard. When the cooked chicken breast and roasted red peppers cooled off a bit, slice them into slithers. 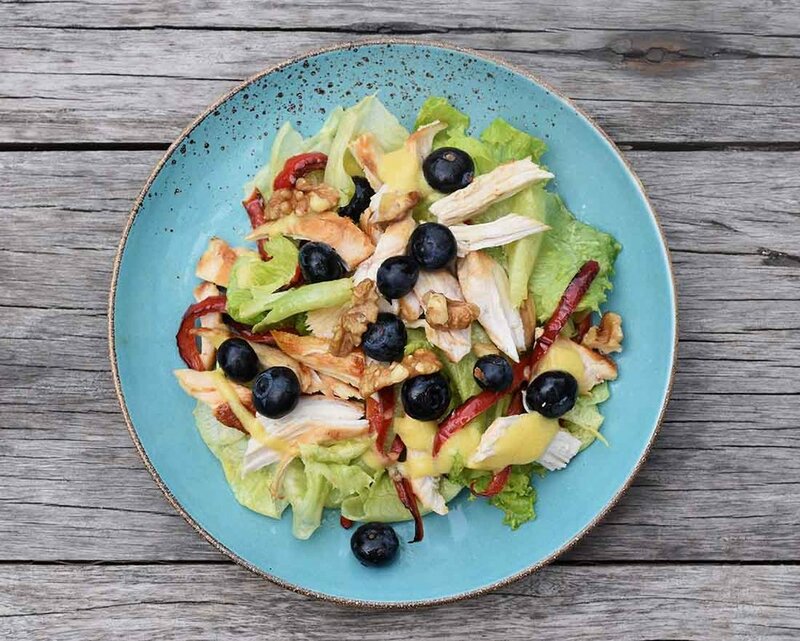 To assemble the salad, toss the lettuce, chicken, peppers, blueberries and walnuts, and drizzle with vinaigrette. Season with salt and pepper, to taste. This recipe works equally well with poached chicken, or roast chicken. Use whichever method works best for you. If you don't fancy roasting peppers especially for this salad, you could use store bought to save time. I usually multiply the vinaigrette recipe by 3 or 4 times and store it in the fridge. You can get a really creamy vinaigrette by whisking with a mini whisk, or shaking the mixture in a jar. P.S. Check out the other Superfood Salads in this series! Salmon, Cauliflower & Pomegranate Salad with Tahini Yogurt.